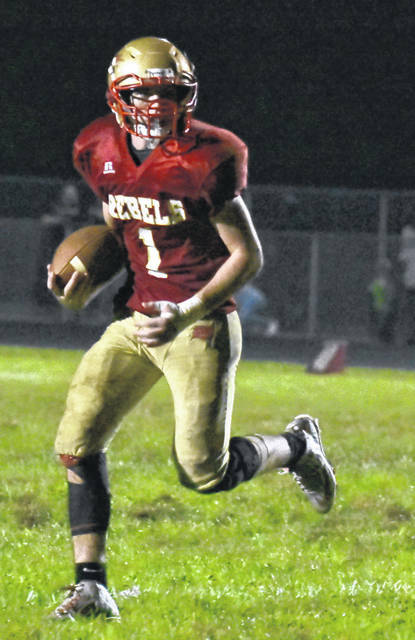 SGHS junior Jared Ward carries the ball during the Rebels 50-31 setback to Belpre on Friday night in Gallia County. SGHS junior Kyle Northup carries the ball during the Rebels 50-31 setback to Belpre on Friday night in Gallia County. MERCERVILLE, Ohio — A plethora of points provided between conference foes. 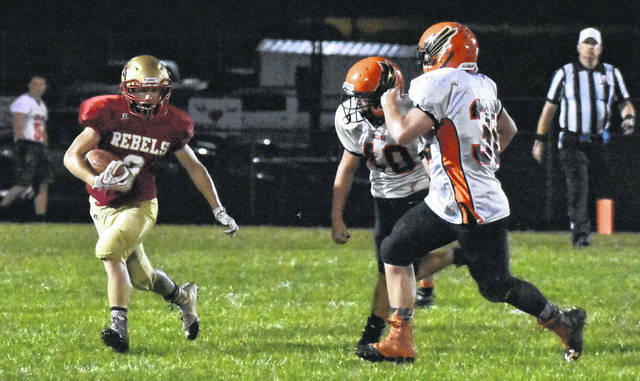 The South Gallia football had a tall order to overcome following a 14-point deficit in the first quarter, as visiting Belpre utilized that momentum to secure a 50-31 decision in a Week 7 Tri Valley Conference Hocking Division contest on Friday night in Gallia County. Following a three-and-out opening drive by the Rebels (1-6, 1-5 TVC Hocking), the visiting Golden Eagles (5-2, 5-1 ) soared to a 7-0 advantage on their first offensive play of the contest, as Logan Adams scampered for an 86-yard touchdown run at the 9:39 mark of the first period. Following an interception by Belpre’s Walker Feick, Jesse Collins propelled the visitors to a 14-0 lead, as he capped-off a four-play 24-yard drive with a two-yard touchdown run with 2:14 left in the first quarter. The Red and Gold cut the deficit to 14-7 with 3:53 remaining in the first half, as Kyle Northup closed out a 14-play, 55-yard scoring drive with a one-yard run, followed by a successful point-after kick by Scott Murphy. BHS responded a mere 1:35 later, with four-play, 78-yard drive — highlighted by Collins second rushing touchdown of the contest from one-yard away to extend its lead to 22-7. SGHS tacked on its second touchdown of the contest, with 1:04 remaining until the intermission as Northup punched in from six-yards out to narrow the margin seven, at 22-15. Belpre, however, countered with just 30 seconds left until the break, as Adams hauled in a 58-yard touchdown pass from Connor Baker to widen the gap to 29-15. The Golden Eagles accounted for all of the scoring in the third period, as Collins’ third rushing touchdown of the game staked the visitors to a 36-15 advantage. The two teams combined for 30-points in a span of 6:43 seconds in the finale. Belpre extended the led to 43-15 with 6:43 remaining in the contest, when Baker connected with Cody Daughtery on a nine-yard touchdown reception. South Gallia closed the deficit to 43-23, as Northup capped-off a 10-play, 60-yard scoring drive when he punched in a one-yard run with 1:51 left to play. BHS junior Jeremiah Weaver’s 51-yard rushing touchdown, widen the lead to 50-23 with just 45 ticks left. SGHS provided the final points of the contest, with just 30 seconds remaining, when Gavin Bevan scampered for 62-yard rushing score, as Belpre closed out a 19-point victory. Belpre claimed a 22-8 edge in first downs, as South Gallia was penalized nine times for 80 yards. BHS was conversely flagged seven times for 65 yards. The Golden Eagles claimed a 2-1 edge in turnovers, as SGHS tossed two picks and the visitors lost one fumble. There was a total of 852 yards of total offense in the contest, as the Golden Eagles claimed a 424-317 advantage in rushing yards and 72-39 edge through the air. Northup paced the SGHS rushing attack with 183 yards on 27 carries, followed by Bevan with six carries for 82 yards. Tristan Saber finished with a 4-of-7 passing performance, including two interceptions, for 39 yards. Three different Rebels players caught at least one pass, as Jared Ward led the way with one catch for 22 yards. Collins led the BHS ground attack with 20 carries for 211 yards, followed by Logan Adams with 106 yards on four carries. Adams also hauled in three grabs for 63 yards to lead all Belpre receivers. Baker finished a 4-of-5 passing performance, including two touchdowns, for 72 yards. The setback for SGHS extends the Golden Eagles’ head-to-head streak to seven consecutive victories. Up next for the Red and Gold, a road date with TVC Hocking foe Wahama.